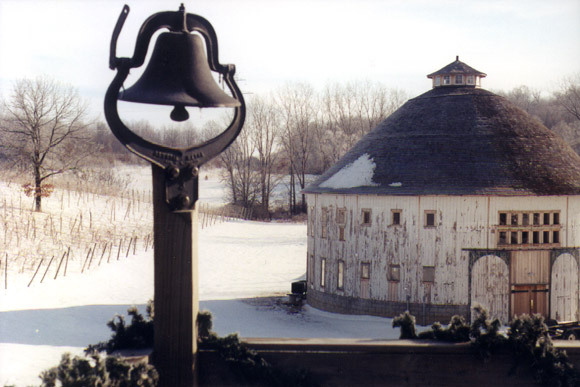 This is undoubtedly the only round barn serving as a cognac distillery. Vintner and former high school science teacher Rick Moersch and wife Sherrie followed their dream and established Heart of the Vineyard in southwest Michigan's fruit growing region in 1992. Today Rick and Sheri produce a full range of white, red, specialty and sparkling wines. Rick's travel to France and classes from French master Robert Leaute of Remy Martin drew him to the production of cognac, a product distilled from wine. But first Rick needed a building to house the new undertaking. 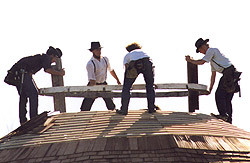 This is how Max and Lori Huffman's Indiana round barn came to be moved to Baroda, Michigan. The 63' diameter Huffman barn in Fulton County, IN was built in 1911 of timber cut on the farm. It has held up to 5000 bales of hay. Paul Brucker owned the barn between 1960 and 1990 when the Huffmans purchased it. 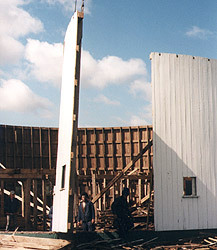 A 1991 windstorm broke one of the circular beams in the roof. An estimated 250-300 round barns were built in Indiana in the 1880-1924 period and today approximately 100 remain, many in poor condition. 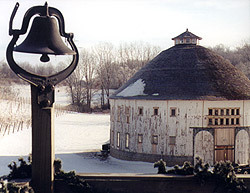 The Indiana Round Barn Survey of 1985-88 found that nearly 40 percent of the round barns existing in 1960 had been lost by 1992. The Fulton County Museum director, Shirley Willard, notes that the first Indiana round barn was built in 1874 and the last one in 1936. 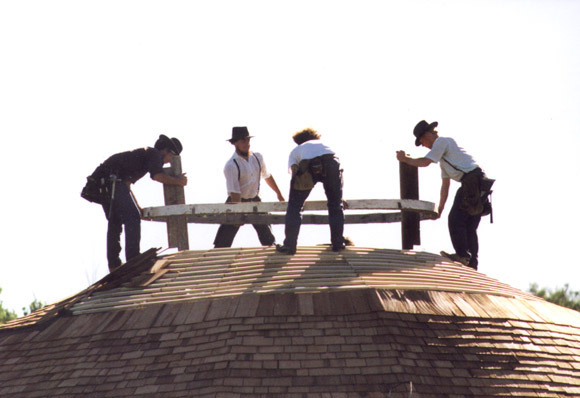 Fulton County, which styles itself as the "Round Barn Capital" hosts an annual festival in June to celebrate this unique construction and the Museum, located in a round barn, is open in the summer months. 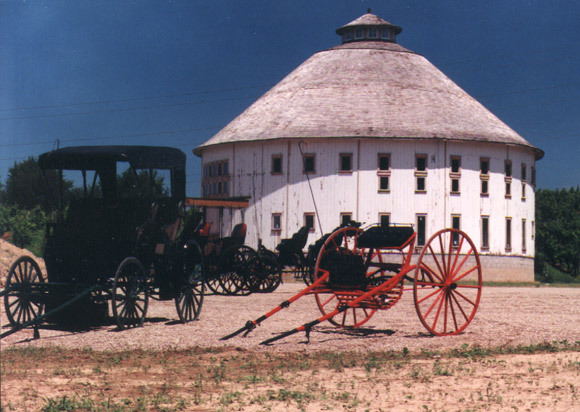 Please visit Round Barns section of The Barn Journal for more information. 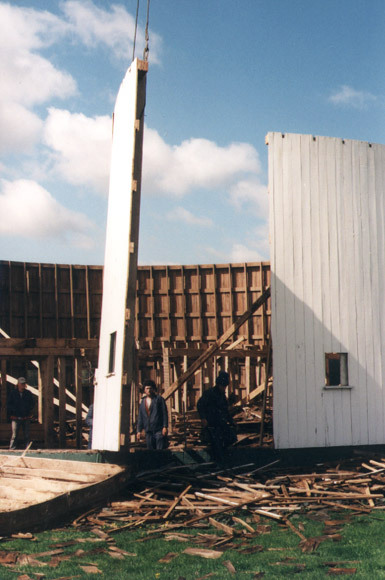 Amish-born Amos B. Swartz, Geneva, IN was employed to erect the disassembled barn on a new block foundation at Heart of the Vineyard. 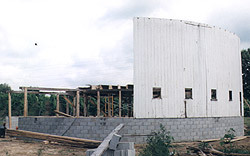 Work began in spring 1997 to dismantle the roof structure, saw the wall into 18' sections and transport everything to the new site 90 miles away in southwest MI. 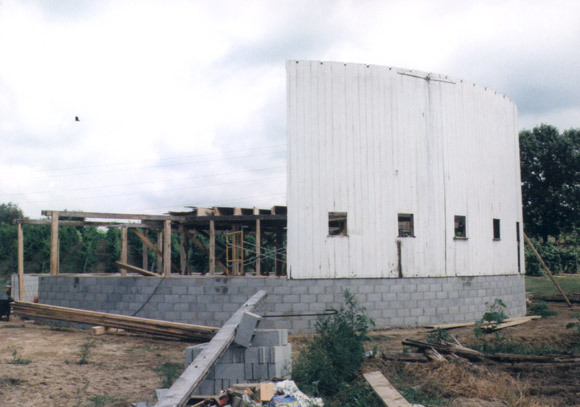 Amos and his crew worked through the spring and summer to complete erection and interior finish work before the 1997 fall harvest season. The completed barn is a signature building that is worthy of the traditions and skill of producing Cognac. The almost century-old building now houses a bar and distillery on the first floor and a restaurant on the upper level. It is the type of building that tells the customer that Heart of the Vineyard is a unique enterprise, the result of dreams and hard work. Heart of the Vineyard restaurant / winery. By Charles Leik, December 2001.